Our outlook on today’s business is to treat every client like family. Build the business on a foundation of innovation, technology and integrity. Our goal at Advantex is to always keep learning and growing, in addition to using the best building products available, and installing those products to the highest standards — above and beyond the local building codes. Consumers have a lot of choices when choosing a roofing company, and at Advantex, we aim to distinguish ourselves in several ways. First, are partners Jim and Jeff that possess unique-to-the-industry, complementary skill sets. Jim has 35 years of construction experience including design, architecture, and home building as well. Jeff has a business background (CPA and CFA) where his focus includes professionalism, timeliness, and attention to detail on all jobs. Second, Advantex partners with local suppliers and vendors in constantly being trained on new products and best installation practices. Finally, Advantex’s mantra is by offering superior service, using premium products, and paying a bit more for the finest crews, that will lead to happy customers which will drive its referral business. By focusing on innovation, technology, and integrity in all the ways we conduct our business, we believe we enhance the chances of delivering the highest quality customer solutions. 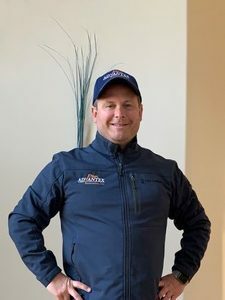 Jim grew up in the western suburbs of Chicago and has always had an interest in the construction business since he was very young, sitting on his bike out front of local construction sites and helping his dad around the house with remodeling projects. After graduating from the U of I at Chicago School of Architecture, his first job as an architect for a local remodeling company. He then progressed into a custom home building company in 1987, when the new home market fell apart in 1993 he went to work for another remodeling contractor to learn the sales side of the remodeling business. In 2000, Jim’s entrepreneurial spirit kicked in and he started a remodeling business. 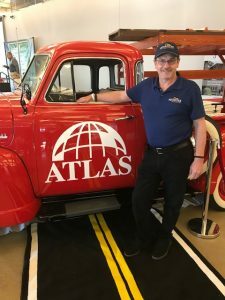 When the market crashed in 2010 he closed up the remodeling business and went to work for a big box store (hating every minute of that life) and found a sales job with a roofing contractor and loved the business. So, in 2014 he branched out on his own and here we are today. Advantex Restoration, Inc.
Jeff grew up with an entrepreneur spirit. As the son of a business owner (accounting firm), Jeff was exposed to various successful businesses. While starting with such glorious teenage roles as paper-shredder, copy-boy, and musty file organizer, Jeff began an educational and professional path to becoming an entrepreneur. After getting his B.S. in accounting from Indiana University and MBA in finance from DePaul, Jeff worked in various finance roles in accounting and brokerage firms and publicly-traded companies. As CFO of another roofing business, he took his business background and managed the financial & back-office operations. 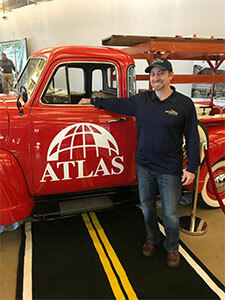 Later he joined Jim and together opened up Advantex Restoration, focusing on helping clients with their roofing, home exterior and interior renovation needs. Don Kelly is our Sales Consultant; he grew up in Joliet and now lives in Aurora. Don has a degree in Business Management from Lewis University. He has held various management jobs and spent over 35 years in Intermodal Transportation Sales. Don came to Advantex Restoration, Inc after he had us build a new roof on his house and garage plus some remodeling on his dormer, porch and garage. Don struck up a friendship with Jim and Jeff and the rest was history. Don likes the fact that “Advantex” uses the best quality materials and does not cut corners to save money. 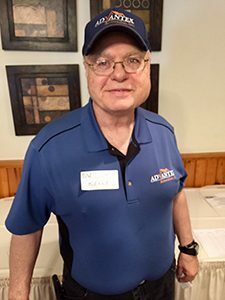 Don is starting his 3rd year and continues to increase his knowledge with on the job experience, seminars, certifications and trade shows. Don loves working to help our clients. Scott’s residential roofing experience spans 7 years in management and operations. Due to his extensive knowledge in residential roofing he manages projects from start to finish in the field. Scott also has an insurance background and still actively holds his licenses, so he is an expert with filing claims and following them through to completion. His ability to communicate with clients and understand the scope of the project, regardless of the complexity, makes him a valuable resource to Advantex. Scott earned his professional training certification in 1998 from the Professional Education Institute in Burr Ridge. He trained sales people for 12 years before entering the world of insurance. He grew up in Michigan and moved to the Chicagoland area back in 1992. He and his wife Carmen have 4 children and the oldest is now in the United States Navy training to become a Navy Seal.